(LOS ANGELES, CA – November 22, 2010) – Multiple Grammy nominated guitarist, Joe Satriani, will be appearing on The Tonight Show on Monday, November 29th where he will be joining Rickey Minor and The Tonight Show band throughout the entire show. Along with the band, Satriani will be performing some of his signature songs as well as some favorite rock tunes. 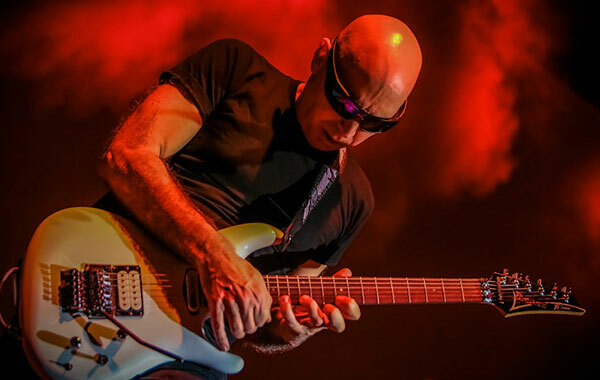 After releasing his 14th studio album, Black Swans and Wormhole Wizards, on October 5, 2010, Satriani embarked on a world tour. Kicking off October 16 in Dublin, Ireland, the tour continued on with sold-out dates in London, Paris, Rome, Barcelona, Moscow and many more. The Birmingham Post exclaimed: “The mystical twist applied to his bluesy, rock precision is what makes Joe and his shows so unique. The encore and crowd interaction ended the night with a standing ovation and a more than satisfied audience. If given the opportunity this is an artist not to be missed”. The European leg of the tour wrapped up on November 22nd in Lisbon, Portugal. North American dates begin on December 1 in Atlanta, with scheduled dates in Chicago, New York, and Boston. The second leg of the Satriani’s Black Swans . . . tour will begin on January 4, 2011 in Edmonton, Alberta, Canada with dates confirmed in Seattle, Portland, the Bay Area and Los Angeles. In addition to the Minaj release, that classic Satriani song can also be found on the newly released, Sony Legacy compilation, Essential Joe Satriani, released on October 26, 2010. Featuring songs culminated from 13 albums – starting with 1986’s Not of This Earth and forward to 2008’s Professor Satchafunkilus and the Musterion of Rock – this album contains a multitude of classic Satriani tunes and even a few surprises! In 2009, Satriani joined with former Van Halen front man Sammy Hagar, former bassist Michael Anthony, and Red Hot Chili Peppers’ drummer Chad Smith, to form the stand-out rock collaboration, Chickenfoot. After a highly successful U.S. tour, their self-titled debut album was certified gold by the Recording Industry Association of America with over 500,000 in album shipments. Over the last two decades, Satriani has traveled the world, playing to sold-out crowds as both a headliner and as founder of the all-star “G3” guitar extravaganza. Of his many solo albums, two have gone platinum and four others went gold, with 15 Grammy nominations between them.